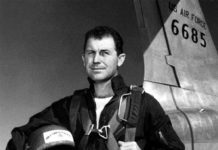 It was just after sunup on the morning of Oct. 14, 1947, and as I walked into the hangar at Muroc Army Air Base in the California high desert, the XS-1 team presented me with a big raw carrot, a pair of glasses and a length of rope. The gifts were a whimsical allusion to a disagreement I’d had the previous evening with a horse. The horse won. I broke two ribs. And now, as iridescent fingers of sunlight gripped the eastern mountain rims, we made ready to take a stab at cracking the sound barrier–up until that point aviation’s biggest hurdle. 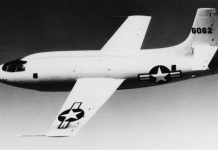 The Bell XS-1 No. 1 streaked past the speed of sound that morning without too much fanfare–broken ribs notwithstanding. And when the Mach indicator stuttered off the scale barely 5 minutes after the drop from our mother B-29, America entered the second great age of aviation development. We’d fly higher and faster in the XS-1 No. 1 in later months and years. 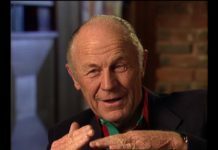 Its sister ships would acquit themselves ably as the newly formed U.S. Air Force continued to “investigate the effects of higher Mach numbers.’ And Edwards Air Force Base, formerly known as Muroc Army Air Base, would witness remarkable strides in supersonic and even transatmospheric flight. But with the XS-1, later shortened to X-1, we were flying through uncharted territory, the “ugh-known’ as we liked to call it. And as ominous as it seemed to us then, that was the whole point. America was at war with Germany and Japan in December 1943 when a conference was called at the fledgling National Advisory Committee for Aeronautics (NACA, NASA’s forerunner) in Washington. The subject was how to provide aerospace companies with better information on high-speed flight in order to improve aircraft design. A full-scale, high-speed aircraft was proposed that would help investigate compressability and control problems, powerplant issues and the effects of higher Mach and Reynolds numbers. It was thought that a full-scale airplane with a trained pilot at the controls would yield more accurate data than could be obtained in a wind tunnel. And, following the English experience with early air-breathing jet propulsion, the notion of using a conventional jet powerplant was advanced. Discussions continued through 1944, but winning the war was first on everyone’s agenda. It wasn’t until March of 1945, with the war drawing to a close, that the project picked up momentum. Researchers concluded, however, that jet engines of the period weren’t powerful enough to achieve the required speeds. 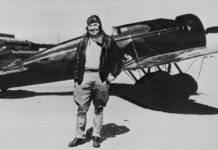 With an engine in place, Larry Bell of Bell Aircraft Corp. and chief design engineer Robert J. 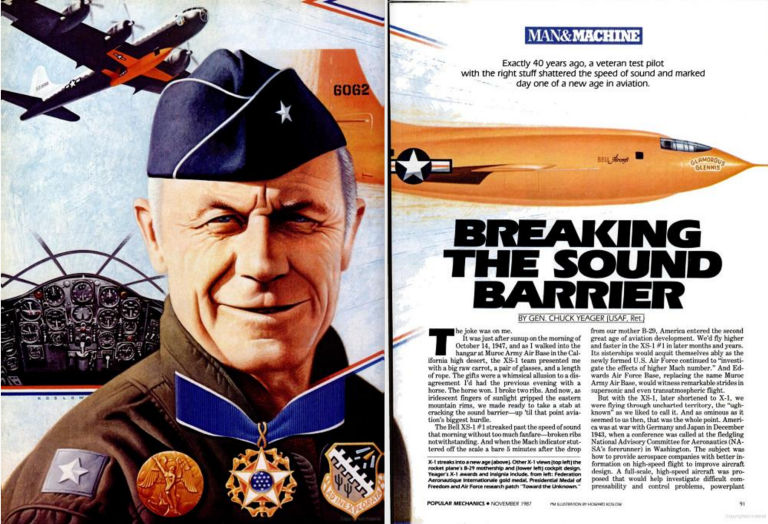 Woods could proceed on the design of the X-1. It was to be unlike any other airplane designed up to that day. The Germans had experimented with rocket planes in the waning days of the war. The ME-163, with its HWK 509C engine, was credited with a top speed of around 600 mph. (The ME-262, with two jet engines, was clocked at 527 mph.) But the Bell X-1 would be far superior–with a clean, aerodynamic profile that whispered “power” even while dormant on the tarmac. The nose was shaped like a .50-cal. bullet, and its high-strength-aluminum fuselage stood a mere 10.85 ft. high and 30.9 ft. long. Wingspan was 28 ft. and wing area was 130 sq. ft. Launch weight was 12,250 pounds. Landing configuration was close to 7000 pounds. Packed inside the X-1’s diminutive frame were two steel propellant tanks, 12 nitrogen spheres for fuel and cabin pressurization, three pressure regulators, retractable landing gear, the wing carry-through structure, the Reaction Motors engine, more than 500 pounds of special flight test instrumentation, and a pressurized pilot’s cockpit. Performance penalties, fuel limits and safety concerns dictated an air launch by a specially modified B-29. (However, I did make a successful ground takeoff on Jan. 5, 1949.) The Army Air Technical Service awarded the contract for the XS-1 No. 1 (serial No. 46-062) to Bell on March 16, 1945, the first of six in the X-1 series. XS-1 No. 2 (serial No. 46-063) was later flight-tested by NACA and was modified to become the X-1E Mach 2+ research plane. 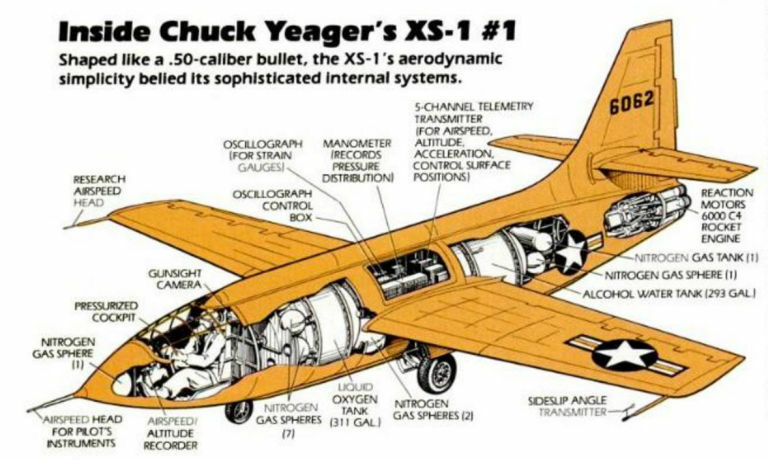 The X-1 No. 3 (serial No. 46-064) had a turbo-pump-driven, low-pressure fuel-feed system. It was destroyed in an explosion on the ground in 1951. The X-1A, X-1B and X-1D were also test-flown. The A and D were also lost to propulsion system explosions. You get the idea that designing, maintaining–and particularly flying–these research tools was not without hazard. 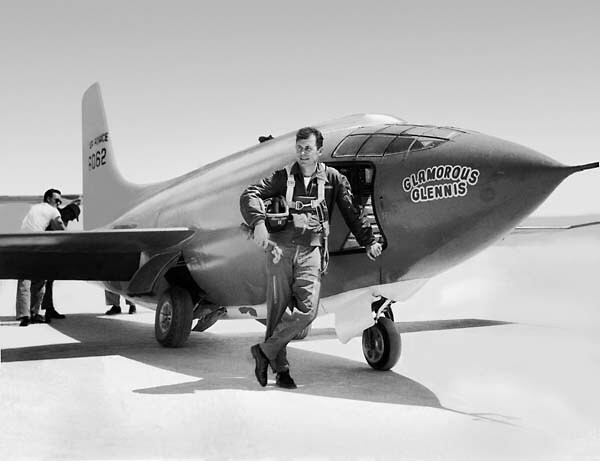 But despite the risks, the first X-1 flew like a dream. Its smooth, precise flight characteristics defined the plane’s personality. I remember pulling three slow rolls on the first unpowered flight in midsummer 1947. And as we embarked on the quest to explore aviation’s potential, fear– albeit subsurface–supplied a businesslike edge to the work. It lurked in the shadows of the psyche as the great B-29, piloted by Maj. Bob Cardenas, lumbered into the crystalline California air with the X-1 clutched to its underbelly. 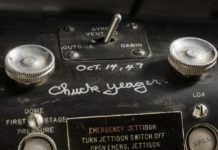 The bomber’s gear would come up and the prospect loomed of having to get into the driver’s seat of the X-1 “in the usual fashion,’ as the unemotional post-flight reports described it. It was the worst part of the whole ride–suited more for a contortionist than a pilot. 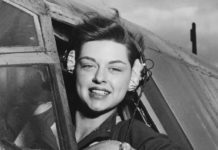 At altitude, engineer Jack Ridley and I would stroll back to the bomb bay, trying not to look through the gap between the mother ship and her tiny orange offspring, named Glamorous Glennis after my wife, who had happily suffered the standard deprivations as an Army Air Corps wife. It was cold and windy as I made my way to the small steel ladder mounted on slides that would descend to the X-1’s cabin door. I’d bounce on it a little and it would drop into position. Then the fun would start. I’d place my right hand up inside the door and hold on tight to the top of the frame–inches away from all that sky. Then I’d slide in feetfirst with my left hand still holding the ladder behind my back. I’ll never forget that bad moment when I’d have to release my right hand and shift my weight from the ladder to the plane. 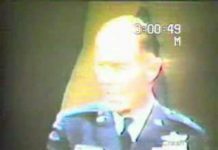 This was the moment–half in and half out–when I always figured the X-1 would get inadvertently released (crack!) from the cable attachment point overhead. Once inside the plane, I’d have to bend around double to turn and slide into the pilot’s seat. But it wasn’t over. I’d still have to contend with the parachute (as much good as it would do in an emergency) and retrieve my helmet and oxygen mask from behind the seat–I’d stuffed my helmet and oxygen mask behind the seat of the X-1 before takeoff, two less items to worry about. When I’d settled, Ridley would lower the cabin door on a small cable and position it over the doorframe. He’d push from the outside and I’d latch from the inside and somehow, in the icy wind, with thinning oxygen and mounting anticipation, we’d get the X-1 ready for flight. The drop itself was the next big obstacle, and like entering the bird, it’s something that I never really got used to. During preflight checks, I’d practice neutralizing the controls and brace myself for the release. Cardenas would go through the countdown, finishing with an emphatic “Drop!” The X-1 would float from the B-29 and I’d get launched right up to the cockpit overhead, caressing the canopy with my helmet in the sudden swell of microgravity. My heart was in my mouth, stomach right behind it. That flight, on Oct. 10, signaled enormous progress in the X-1 program. We thought it was only a matter of time before we’d push through the sound barrier. What would it be like? A pebble in the road of aviation we had merely to step over? Or an insurmountable Chinese Wall that would destroy the X-1–and me with it? Naturally, thoughts at these moments turned to Glennis and my boys, who sacrificed plenty out in the desert in those brightly lit days of the late 1940s. I wanted to fly, wanted to take my shot at the speed of sound. And they were my own personal cheering section. As I stood looking at my carrot, my glasses and my rope on the morning of Oct. 14–broken ribs secretly knifing at my side–I thought that this just might be the day. The eighth powered flight had gone exceedingly well. We had flown as fast or faster than anyone ever had before. And it looked as though we only had to step over the line to enter aviation’s new age. The day of the ninth powered flight began in the usual way. I fried the eggs while Glennis got ready to drive me over to the airfield. I’d had a bad night’s sleep–from the pain in my side, but also from the indecision about whether or not to fly the mission incapacitated. Tossing and turning, I decided to make up my mind in the air. If it became physically impossible to climb into the X-1, then I’d scrub the mission. If I could get into the pilot’s seat, I knew I could fly. 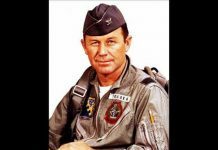 As the team swarmed over the X-1, with cords from trouble lights dangling in the early morning gloom, and tools, racks, ladders and other gear surrounding the little ship, Ridley began the preflight coaching. “We got that Drene shampoo for the windshield,” he said, “so you shouldn’t have any trouble with the windscreen frosting over. Now remember, you play around with the stabilizer setting before you make your high-speed run. We know you’ll lose some elevator control, so find out where you get the most longitudinal control with the stabilizer. Try it at different settings and different speeds above .85 or .86 Mach.” Discussions continued over coffee. There was a heightened intensity, a new determination, on the part of everyone involved. This was it. This was the day. Would it end with another record shattered? Or with failure’s grim finality? After the X-1 was fueled, I returned to the ready room with Ridley to don my flight suit. Briefings continued, peppered by admonitions and warnings: “Under no circumstances are you to . . .,” “In the event of . . .,” “You’d better be sure to . 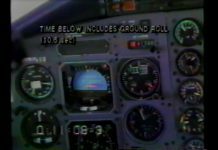 . . .” Their whole point was to make sure I didn’t take the X-1 over .96 Mach if I didn’t think the plane could handle it. Fear crouched in the deep recesses of the mind–present, accounted for, but well controlled. With the fueling and mating procedures completed, I walked back out to the B-29 and stooped low to make a last-minute check of the X-1’s instrumentation. My helmet and oxygen mask were well secured behind the seat, I jogged to the boarding ladder and started climbing. Then there was the long wait as the B-29’s engines fired, the big bird began its takeoff roll and lumbered up to the drop altitude. I sat on a metal box inside the plane, ignoring my safety belt against the regulations. At 5000 ft., I nudged Ridley and said, “Let’s go.” We walked back to the bomb bay hatch and strode through. There was the little X-1, dangling in all that wind and cold and thinning air. Every move was torturous at this altitude. Getting into the X-1 on a good day was tiring enough. But I struggled through, wangled the hatch closed with the help of a 10-in. piece of broomhandle I’d fashioned for the purpose (because of the limits imposed by my broken ribs) and continued checking the X-1’s pressurization, fuel delivery and controls. 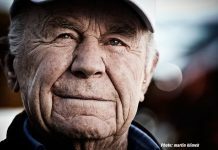 Richard Frost, Bell project engineer, was flying low chase that morning, and Lt. Bob Hoover was flying high chase well ahead of the B-29, both in Lockheed P-80s. In the standard routine, Frost would pull into a slight climb as I lighted the first chamber, aiming for Hoover’s P-80 about 10 miles ahead. I would try to pass Hoover at relatively close range as the fuel supply depleted, and he’d follow me down for an unpowered landing on the lakebed.